We would like to introduce our company D.E.CORP as the largest manufacturer and exporter of ethnic, traditional, indo western hand beaded and machine work EMBROIDERY FABRIC and garments in India. 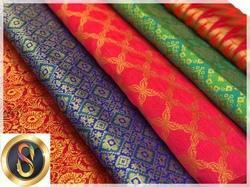 Backed by rich industry experience and market understanding, we are involved in offering a wide array of Mastani Silk Fabric to our valued patrons. With genuine intents to elevate the standing we have built in this sphere, we are immersed in presenting an inclusive array of Silk Satin Fabrics.